I love to create while writing longhand. While I have not conducted clinical research on myself or anyone else for that matter, I believe that the act of pushing a pen on paper keeps me sharp. I believe this with such conviction that I write with a pen on paper every single day during a timed (15 minute) session. I don’t especially care what I write about. I don’t usually have a plan of what to write but I do it regardless. And, usually by the end of 15 minutes, I have written a few sentences that actually make sense. What my longhand looks like. Yikes! Yup. I can read it. 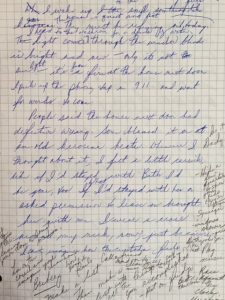 When Stephen King writes about his characters, he does it longhand. James Patterson, apparently, writes his entire novels with a pen. For many of us, pushing a pen (or pencil) on paper feels good. There is a sense of space, of creativity, of genuineness. If writing is a consequence of dreaming and thinking, then the process of putting ideas to paper seems more natural than clicking the keys of a keyboard. Let’s go back to that idea of keyboarding or the earlier term I used in my monthly newsletter, keypunching. There is a nosy rhythm to tapping keyboard keys, a boring, mind-numbing sound as my fingers pound the letters, stringing letters into words, words into phrases, phrases into sentences, sentences into paragraphs. I’m boring you, right? When I compose sentences on paper, I draw arrows, rectangles, stars and circles all over my work. I can visualize exactly where I wrote a certain idea. I can see it in my dreams. I make fewer errors of ideas, spelling or grammar when I write longhand. Further, I don’t have to deal with the dreaded auto-correct feature. Ah, the tools of the trade. Does it mean extra work? Sure. Eventually I have to transcribe my scribbles onto my iPad or computer but that is part of the process, of slowing things down, of creating something organic and real. When one of our children attended what used to be called grade 13 in our local rural high school, she enrolled in a course called Writer’s Craft. I wish there had been such a course while I was a high school student. 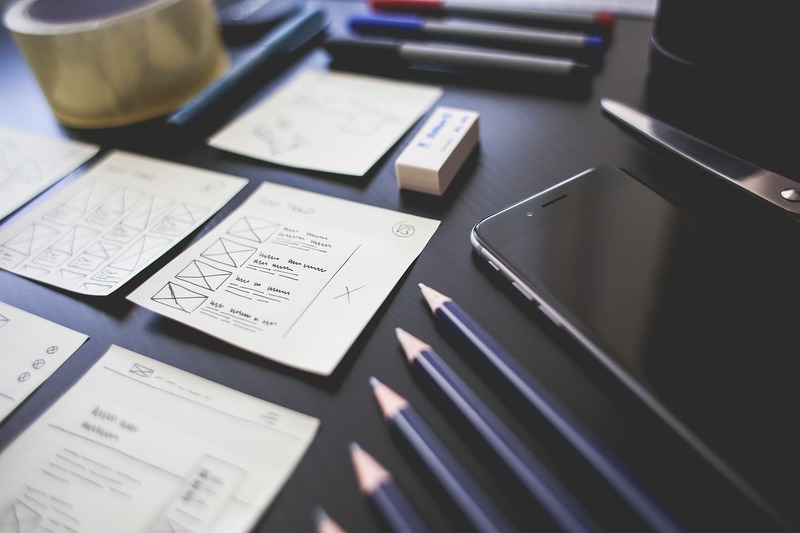 The idea of pen and notepad evokes an idea of craft, doesn’t it? 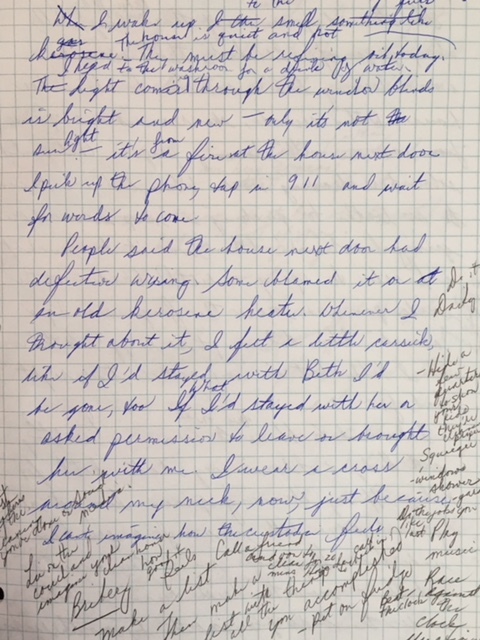 When I write longhand, I have the ability to shut the world out, to let my thoughts flow through the movement of the writing tool on the page. The process of doing this feels like the fluid ink is keeping me company. There is a deep uninterrupted connection from my brain to the paper. I never have to face a blank computer screen, the little cursor with its never-ending blinking. Writing longhand brings me pleasure. I can sit in a corner of my favourite coffee shop. No one cares what I’m up to. I could be writing out my shopping list for all they care. Likely, they don’t care. And that’s fine by me. NOTE: At least when writing longhand, I’m not distracted by other tasks, like repairing my website or adding pictures to my Instagram account. ‘I’ve worked this way for as long as I can remember. The Rhodia [pen] allows me to move around at will, as if on a computer, so that if I get stuck, I can just scoot over and start something new elsewhere. But because I’m still writing on the same page, I can always reference what I’ve abandoned, in case I want to crib from it a sentence or a thought. And if I have a random thought, I can jot it down somewhere else and then come back to it — and there’s room for that. Looks so clinical, doesn’t it? ~ I can write absolutely anywhere. I don’t need to remember to bring or charge my device. If I have a pen or pencil plus paper, I’m golden. ~ there is something inherently creative about making shapes on paper, even if they are letters rather than doodles or doodles rather than letters. ~ I’m a leftie and my handwriting leaves something to be desired. I am forced to get the next word down and not go back and reread what I’ve written. Longhand forces me to forge ahead. What do you think about longhand writing? Do you take part in longhand or do you prefer a keyboard? And why? Answer by writing a comment on my comment page on this website. I recommend that you read this short article on the benefits of Slow Writing. Want to get my monthly newsletter? Click here to become a subscriber. Love this. What a great article! Thanks for taking the time to comment, Kathleen. Your positivity about the article makes my heart swell.